Julie Smith is Director of the European Centre, POLIS Department, Cambridge University, and Fellow of Robinson College, Cambridge. She is also a member of the United Kingdom House of Lords. Since their inception, the European Communities and, later, the European Union (EU), have undergone significant changes, some of which have proved to be controversial, demonstrating the policy differences between those believing in ever closer political and economic union and those who favour a trade agreement only. The EU’s ultimate aims have been raised and discussed many times during its history, and the referendum held in June 2016 in the United Kingdom, at which a slim majority voted to leave the EU, may prove to mark a watershed in the organization’s continuing development. This series aims to analyse the EU’s previous and possible future reforms, the negotiations and renegotiations that have significantly affected and changed the organization, and the reshaping of the EU in the aftermath of the eurozone crisis and the Brexit referendum. 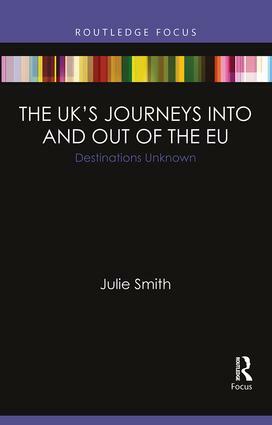 Full length interview with Julie Smith, author of the timely book: The UK’s Journeys into and out of the EU: Destinations Unknown. Julie shares insights into the UK’s history with the EU prior to joining the single market and how it shaped UK’s relationship with the European Union as it now decides to leave. With Brexit, British citizens are feeling more engaged with politics than ever, find out more about Julie’s book in the video.